The historic county town of Nottingham, situated on the River Trent in England's East Midlands, is universally known as the home of the world's first 'superhero', the legendary Robin Hood, who famously 'robbed from the rich to give to the poor'. Today's historians have cast doubt on whether Robin actually existed; and if he did, whether he did indeed live in Sherwood Forest near the city and do battle with the wicked Sheriff of Nottingham, as the much-vaunted legend has it. What is not in doubt is that Robin has done much to promote tourism in this ancient city, which boasts another, very real and unique attraction in the form of a system of sandstone caves beneath the city, used as dwellings by Anglo-Saxons and later as the medieval hang-out of thieves and vagabonds, and even later as bomb shelters during World War II. From an Anglo-Saxon settlement founded in around 600 AD, Nottingham developed into an important commercial capital for the region during the Middle Ages, and then went on to become one of England's major manufacturing cities, producing top-quality Victorian lace and hosiery. 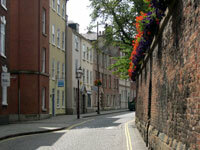 Today, it is saved from being just another heterogeneous English county capital by its legends and unique attractions, making it a city well worth including on the itinerary of any tour of the British Isles.